Welcome to the Community Web Site and the Information Repository for the Milan Army Ammunition Plant Environmental Cleanup Program. An information repository is where current information, technical reports, and reference materials regarding a Superfund site are stored. The repository is established in the community at the beginning of the site studies to provide the public with easily accessible information. Repositories are established for all sites where cleanup activities are expected to last for more than 45 days. Typical repository locations include public libraries, town halls, municipal offices, etc. You can use this Web site to access electronic copies of the documents contained in the Information Repository. To search the Information Repository select the Advanced Search button, enter your search criteria (e.g., key words), and initiate the search. Select the Quick Search button to view a listing of commonly used predefined searches. Results will be provided in table format with links to the associated documents. 1075-A E. Van Hook St. 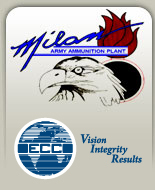 The Milan Army Ammunition Plant Information Repository web page information is an electronic copy of official documents and reports which comprise the Information Repository. The legal, paper Administrative Record File is held at the Milan Army Ammunition Plant. As directed by US EPA guidance, the Information Repository has been made available to the public. The web based version of the Information Repository is considered to be a copy of original documents and reports.